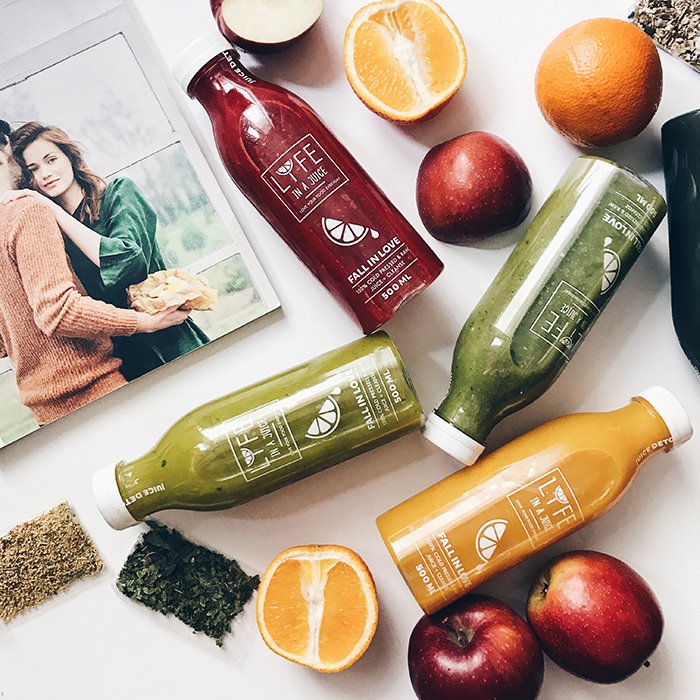 Juicy detox with LYFE in a Juice – YAY or NAY? LYFE Diet Catering you may know from our Insta Stories. Although this Poznan based company started by providing diets for people looking to improve their appearance and health, we were interested in their additional pillar – cleansing and slimming diets in the form of juices, which are sent through couriers to customers throughout Poland. We talk about our insights in the text below. Interested? Read! According to the information on the LYFE website, juice diets help to clean the body of toxins and lose unnecessary pounds. LYFE in the process of creating cleansing treatments uses the latest cold pressing technology. 500 ml bottles contain minerals and vitamins from a whole range of fruits and vegetables. LYFE juices accelerate the metabolism, have a positive effect on the appearance of hair, skin, nails and are anti-cancer – all thanks to a large amount of phytoestrogens and antioxidants contained in plants. The treatment should not be used too often. LYFE recommends a repeat every 2-3 months. Among the flavors you will also find super foods – kale, baobab, spirulina, avocado, mango, coconut milk or chia seeds. We have used FALL IN LOVE several times. Although at the beginning we approached this idea skeptically… we took a chance. By ordering LYFE juices we received 6 bottles of 500 milliliters each (turbo-colored, superfooded) wrapped in beautiful cardboard packaging. Each kit was additionally provided with a manual and a package of herbal teas that helped us to survive the horrors of hours without eating. Although we won’t tell you about the miracles of losing kilo,s we have to admit that these treatments are an amazing test of ourselves, our patience and perseverance. Every time we have to ask the question – can we do it? And we survived! After the treatment we felt better and after a few days you can really lose several pounds. Juice diets are ideal for warm days – then your body is asking for liquid food. We were on detox during winter and summer – the first was much more difficult, but drinking warm herbal tea made us feel like we would continue our juice adventure. We were curious about the juice detox subject, so we decided to speak to the personal trainer – Olga Lipczyńska, who used juice detox several times now. Read her hints below! Fotografie z powyższego kolażu wykonała Olga Jędrzejewska. The juices give a feeling of lightness, and a few days of treatment in her case improves the appearance of the skin and general well-being. Juice diet is a rarity and should not be used too often. It will never replace a normal diet, even if it is high in calories. That’s why LYFE offers a one- or five-day treatment. It is good to choose the right moment to carry out such a detox. A lot of responsibilities and stress associated with their performance certainly do not favor detoxification. Do yourself a detox when you are 100% determined. If you are curious how it works, you want to create new habits and see how much your body can survive – try it. We do not negate this type of ideas, because there are vegetables and fruits that we often overlook and treat as necessary. Let’s not be afraid of them. They are great! For more information about juices go to LYFE website. We recommend that you consult with a LYFE dietitian to help you match your lifestyle. Do you think any of your friends might be interested in this topic? Share the text with them!